This isn’t sketchy at all…. No there isn’t anything sketchy about a man going into Target and buying a digital scale and vacuum sealer. I also didn’t appreciate the 19 year old Target employee who was helping me adding air quotes around the word “hops”. 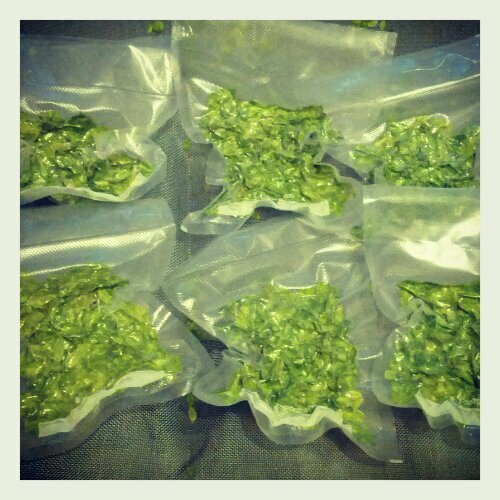 With my hops properly dried it was time to bag and seal them into order to preserve their flavor and essential oils. 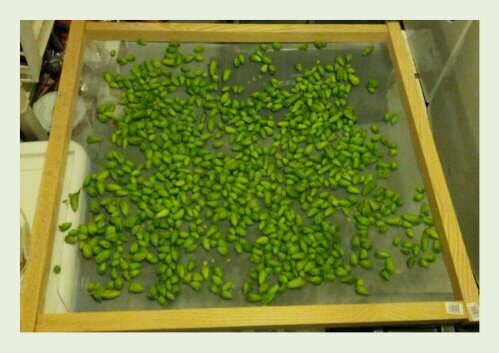 The last time we saw my bed of dried hops them looked impressive all spread out on my homemade drying rack. 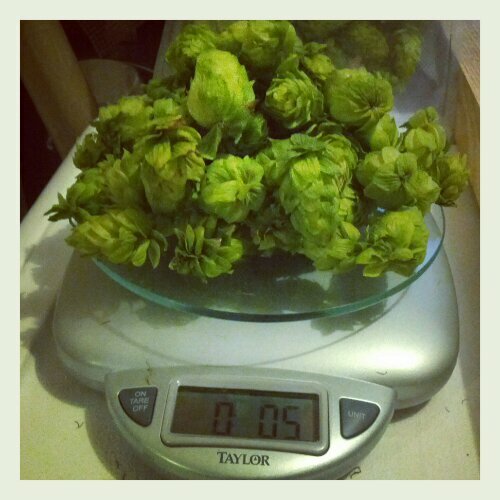 If you would have asked me then “How much hops do you think these all weigh?” I would have said 2 pounds and then admitted that I am terrible at guessing the weight of stuff. I am pretty sure I had chicken pox when they taught ounces/cups/liters/etc. I am completely ignorant on the subject. On the plus side the digital scale works great. It was a tad small though so I ended up having to stack the hops in a weird game of Jenga. Placing a cone here or there trying to get the digital number to change from 0.2 to 0.3. One misplaced cone and they would all come tumbling down. After weighing them I was able to bag six 1 ounce bags of hops. The vacuum sealer sucked all the air out of the bags turning my vibrant full cones into a green looking mush. I was concerned that sucking the air out of them will crush them so I reopened one of the bags and the cones sprang back to the original form. With these guys weighed and sealed I popped them into the freezer to save them. I have read that hops stored this way will last for over a year. Hopefully I will have used them all before that. Now I just need to decided on an IPA to brew next. 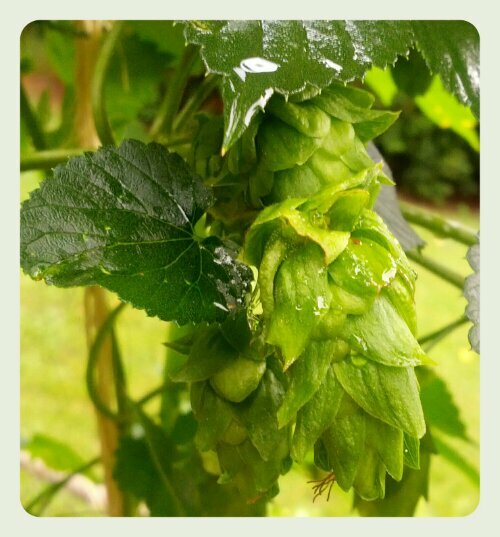 I have been reading about the amount of hops needed to make a strong hoppy IPA and it looks like I might end up using all the hops in my next batch. Thankfully there are still cones left to be harvested and hopefully I will be able to get another 6 ounces this weekend. Finally the day has arrived. After months of care I am finally able to harvest my first batch of hops. 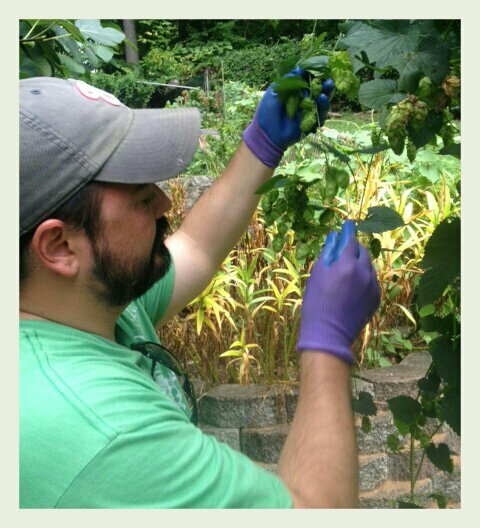 I did some research on the best way to harvest hops and apparently there are two basic options. The first is to untangle the vine, cut it and take the whole thing down. Since I have three plants and they ended up very tangled up that was going to be a huge mess. I opted for the second option which was to just pluck the cones off individually. Everything I read about growing your own hops warned to not get my hops (hopes) up on my first harvest. 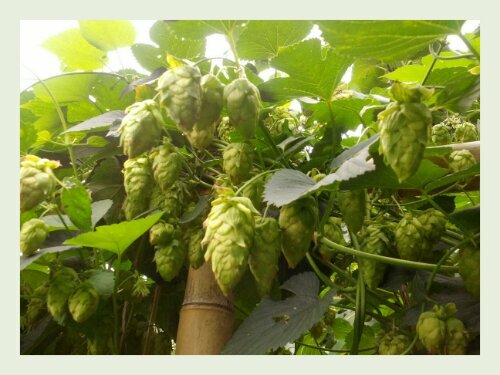 They stated that the hops are spending a lot of their energy growing their roots so the harvest might be slim. Luckily for me I planted three plants so I was still able to fill a medium size bucket with cones. The bright purple gloves were because the vines have these tiny hooks in them that help them climb and can be a real irritation to the skin. Plus they look fabulous! This is a close up of my bucket filled with cones. There isn’t a filter used on this picture they were a vibrant green and felt like the paper origami my sister and I would spend hours trying to create as kids. There was this one origami where you folded the paper to create a square-like ball. If done correctly there would be a little hole left open in the middle that you would blow air into to inflated the ball. 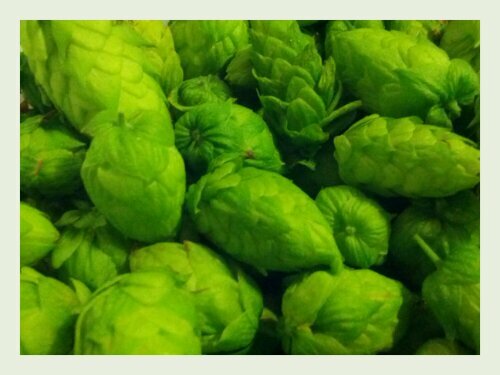 The hops reminded me of that piece of origami. Only when I pressed my fingers together the cones would spring back into its original shape. Origami usually doesn’t do that. By far the best attribute of these cones was the aroma. I remember seeing a Samuel Adams commercial where the founder, Jim Koch, is shown diving his nose into hops as a bunch of Bavarian hops farmers stared at him like an American madman. I understand why he did that. The smell is amazing and it infused me with a passion to start brewing right away. 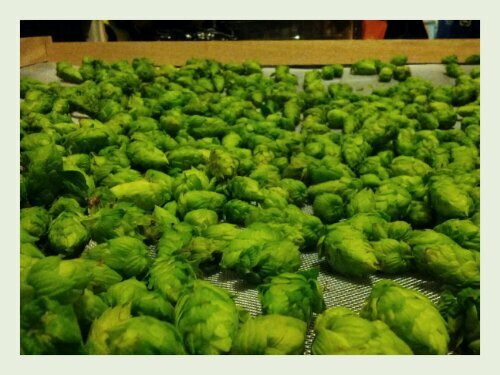 After harvesting the next step is to dry your hops. If not properly dried the cones can become moldy. I set up the ugliest drying rack in my laundry room. My original intention was to put together a well crafted drying rack that I would keep through the years and eventually pass down to my sons who would fight over it. Unfortunately that would not be the case today. I am not a handy guy. I went to Home Depot and some how purchased the wrong type of wood to go with the wrong type of nail. I did buy a staple gun but of course bought the wrong staples for them. Tim “The Toolman” Taylor would not have been impressed. 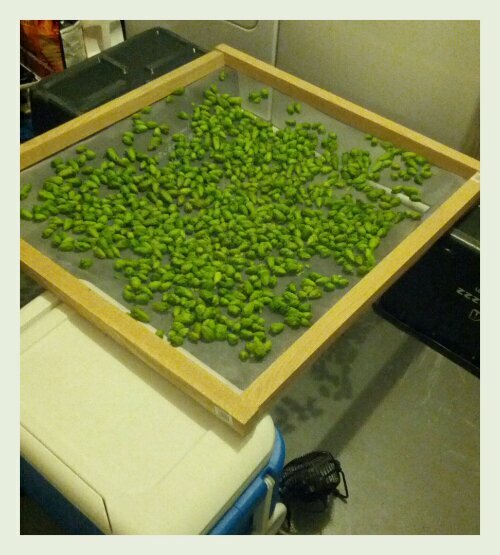 I was able to MacGuyver something up that was serviceable for drying my hops. I spread out the cones across the screen and set up a little fan underneath to get some air flow. I will need to turn the hops a couple times a day to ensure they dry properly and avoid any mold. The whole process should take a couple of day. 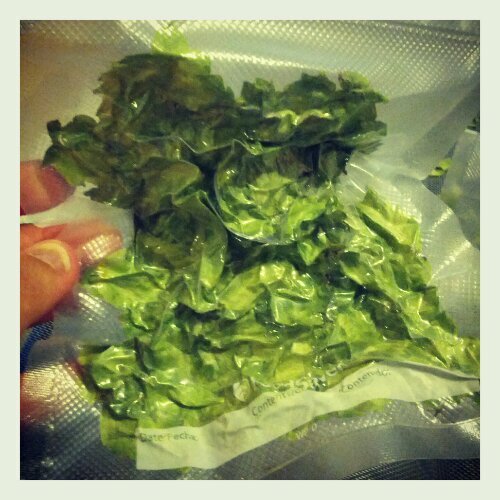 Once that is complete I will weigh and vacuum-seal the hops. then toss them into the freezer until I need to use them. If all these steps are done properly the hops can last for well over a year. There were still plenty of hops left to harvest so I should be able to get at least one more batch before cutting the vines back. 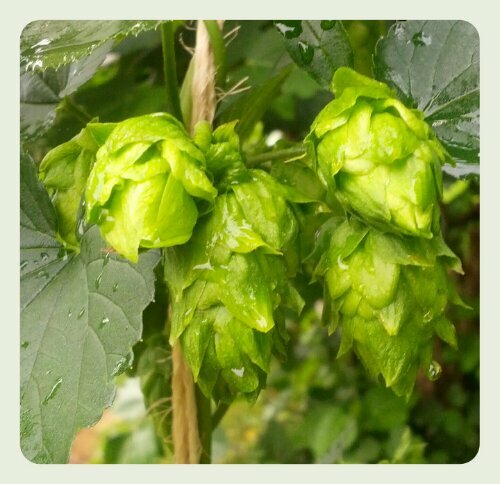 Now it’s time to decided what type of beer to brew with my hops! I think I have to go with an IPA with extra hoppiness. 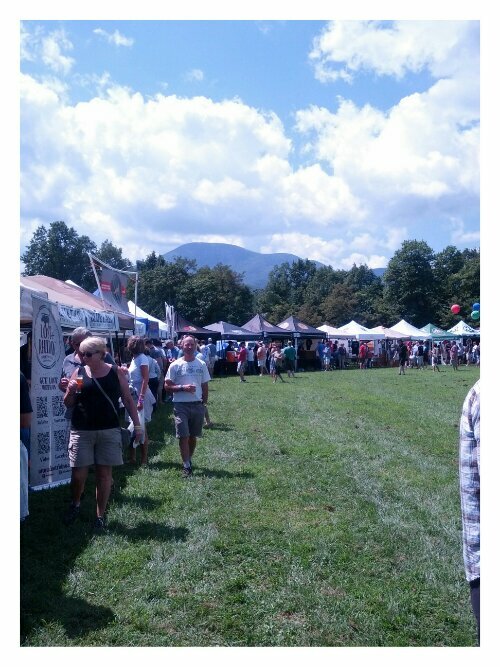 This past weekend I was lucky enough to attend the 2nd annual Virginia Craft Brewers Fest (VCBF) in Charlottesville, VA. 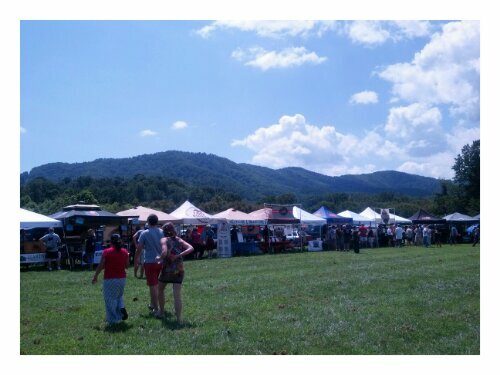 The VCBF was held once again at Devils Backbone Brewing Outpost and featured over 30 Virginia breweries. The weather this year was perfect. The sky was a clear blue allowing you to take in Devils Backbone’s amazing scenery. The brewery is surrounded by rolling mountains of green trees that tumble into one another. The natural beauty of Charlottesville is such that whenever I visit I end up contemplating what I am doing with my life. Thoughts of selling everything I own packing the family up and moving down begin to tickle my ear like the banjo from Bryan Elijah Smith & The Wildhearts that was playing on the stage as the festival began. I’m a sucker for VIP and free shwag but purchasing the VIP package was the way to go for more reasons than the complementary glassware it bought me. Not only did I get the 4oz tasting glass (above) and a commemorative VCBF beer glass I was also able to use the tented area to get out of the sun or skip the lines for the restroom. By far the best bonus of the VIP package was being able to enter the festival one hour earlier than the general public. 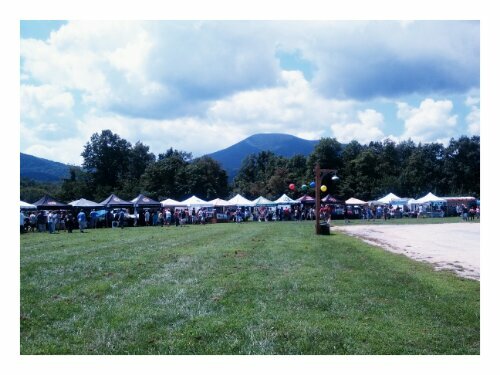 Imagine a line of booths cutting across an open field with each booth containing an eager brewery waiting for you to walk up and ask them about their beer. This artery of craft beer provided an unique opportunity to talk to the owners/brewers/employees of many of my favorite breweries. Being able to meet in less crowded setting allowed you to chat without feeling like you were holding them or anyone behind you up. I was also very impressed with the efficiency of the VCBF staff and organizers. Everything from parking, Eventbrite mobile tickets and free water station seeming perfectly organized to allow craft beer lovers to have an amazing time. The free water was a much appreciated smart touch. While the weather was beautiful standing in the sun for hours drinking is going to take a toll on anyone. It was refreshing being able to grab a cup of cool water and definitely prolonged everyone’s day. Also I was impressed that the festival offered a VIP package for designated drivers. My wife, who does not drink, was SUPER AWESOME to offer to be our DD for the day. She was thrilled to be able to drink as much of her preferred beverage (Coke) as she wanted for free. It was little touches like that as well as the friendly staff that will make me return to this festival every year. 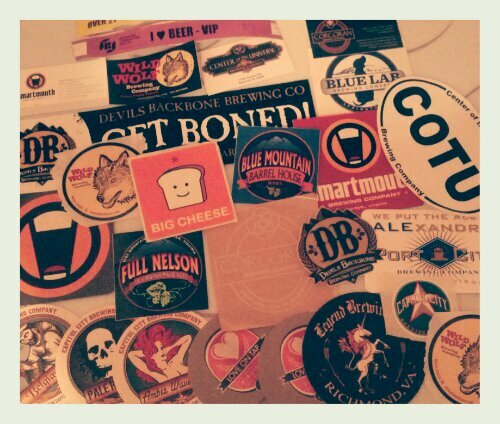 People have asked me what beers were my favorite. For me that is an almost impossible question to answer for a couple of reasons. I don’t want to come off like an unsophisticated homer but I truly enjoyed 98% of the beers I tasted. Perhaps I don’t have the properly trained palette yet but these breweries were being judged on the beers they were pouring so they weren’t going to bring anything that they didn’t know was great so that 2% of beers I didn’t care for were more because of I’m not a fan of that style of beer (Sour beers, yowza!). The Admiral (Three Brothers Brewing): Winner of Gold in the Strong Ales category and was my favorite IPA of the day. Three Brothers Brewing is out of Harrisonburg, VA and are also the winners of my new favorite new brewery category. 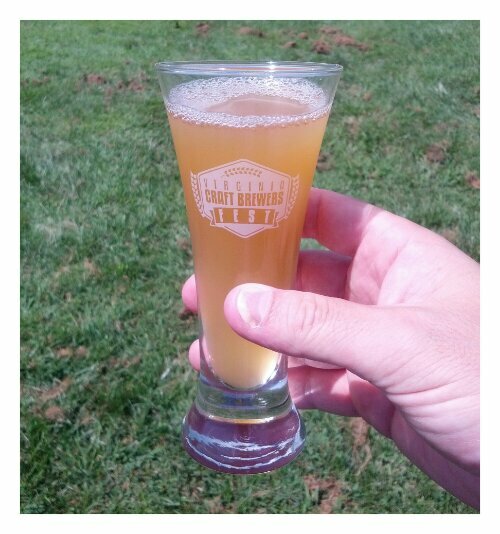 Pear Lager (Devils Backbone Brewing Outpost): Winner of Silver in the category of Fruit/Spice/Herb/Vegetable. This was a nicely crisp and refreshing lager that was exactly what I was looking for on this hot day after tasting many many IPAs. Kolsch 151 (Blue Mountain Brewery): Winner of Gold in the Light & Amber Hybrid category. This is a beer I can have anytime of the year. 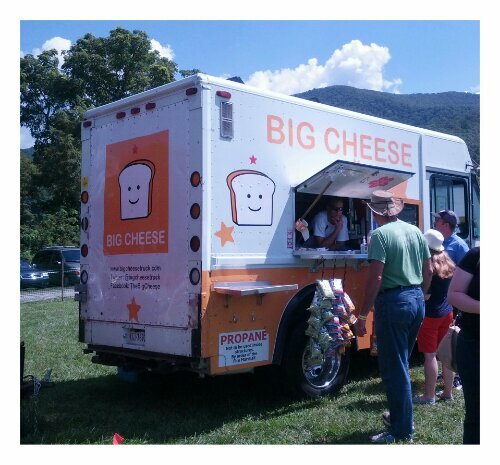 My only suggestion for an even better festival next year would be to double (or triple) the number of food trucks. 2200 people bought tickets this year and only 3 trucks. Each truck was amazing but they were slammed and the waits were long. Today is a special day for iHeartBeer. It’s our birthday. Not the birthday of iHeartBeer the blog but iHeartBeer the man. It is also the day we officially can no longer claim to be in our mid 30’s and must accept our status of being in our late 30’s. 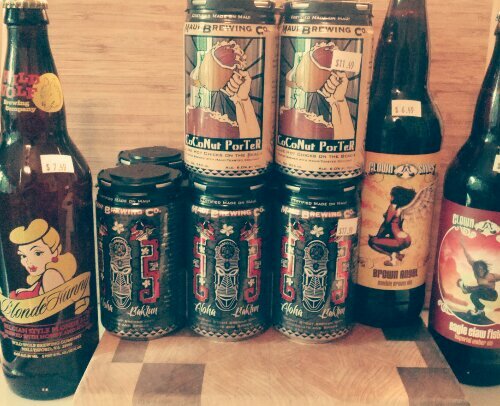 In order to mark both the occasion and lessen it’s sting we were presented with some wonderful beer related gifts. 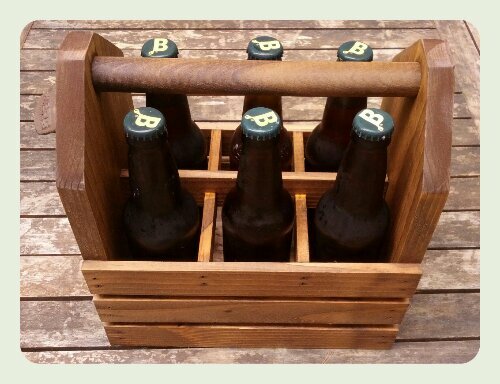 First my wife gave me this beautiful handcrafted wooded six pack carrier. 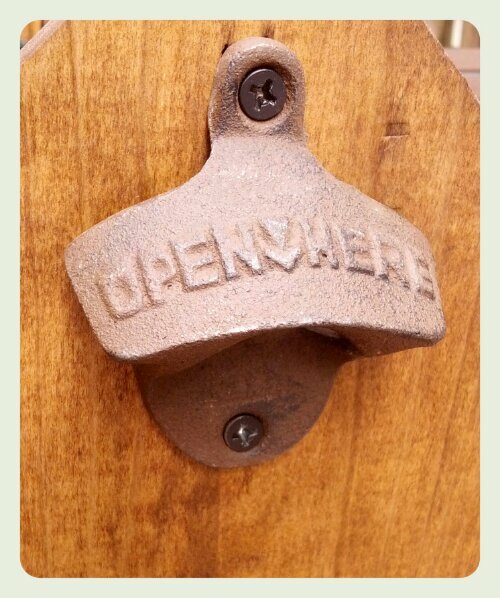 Equipped with it’s own bottle opener. It looks amazing stocked with six of my homebrews and just feels awesome to carry. 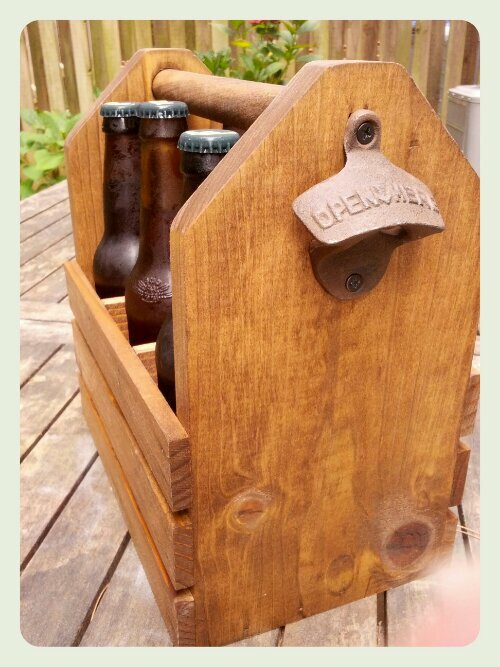 It’s like I’m carrying an old tool box but instead of tools that I have no idea how to use it’s full of beer that I definitely know how to use. 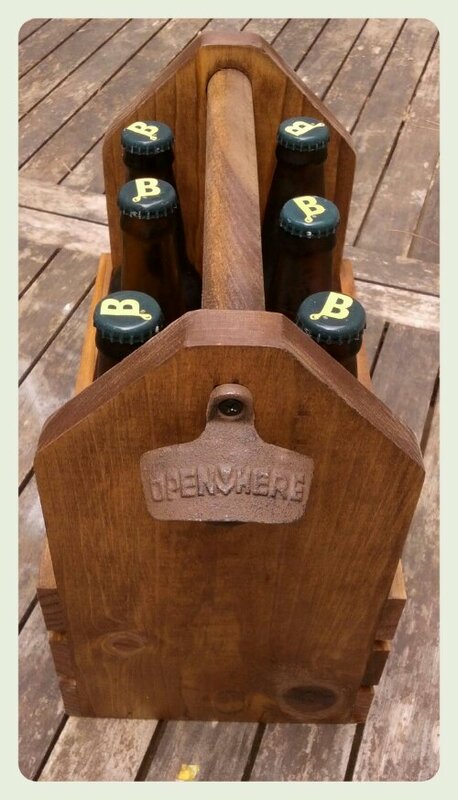 The next gift came from my wonderful in-laws who found a way for me to enjoy one of my all time favorite beers even more. Tripel Karmeliet is a Belgian Tripel that I have spoken very highly of in the past and I thought there was no way I could love this beer even more. 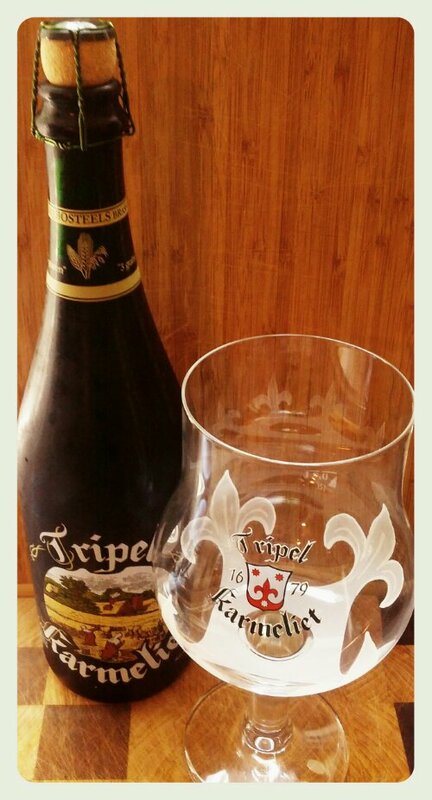 That was until I received a Tripel Karmeliet glass specially designed to be for this beer. 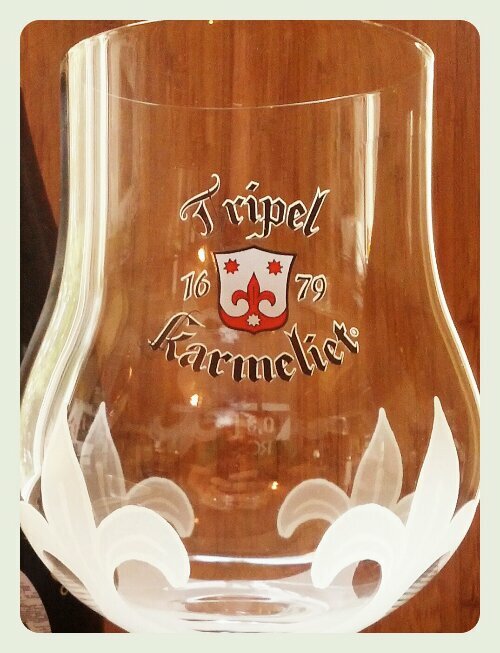 Designed by Antoine Boosteels, of Bosteels Brewery, maker of the Tripel Karmeliet this elegant glass is decorated with four Fleur-de-lis. According to Bosteels Brewery the pourer holds the glass at a slight angle and slowly begins to fill the glass until the beer reaches the tips of the Fleur-de-lis. The rest of the glass will be filled with a nice frothy head. It just so happens I happen to have a bottle of Tripels Karmeliet downstairs in my beer fridge. Thank you everyone for the birthday wishes and my family for these amazing gifts. They will be put to good use. I saw this video on posted on CraftBeer.com’s Faceboook page today. 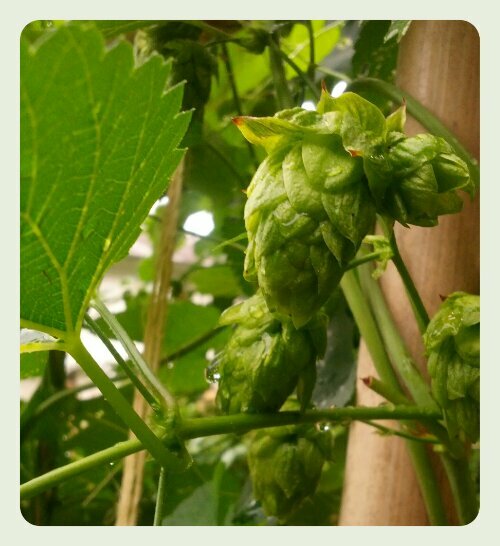 They are talking about the type of hops I am currently growing (Cascades). 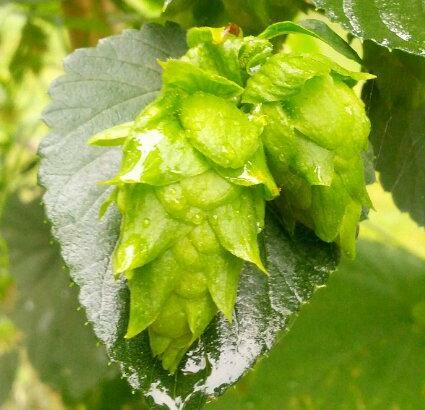 I thought it was interesting how a type of hops that was essentially ignored by the big breweries and “left on a shelf” at Oregon State University due to having too much aroma is now fueling thousands of craft breweries in the US. 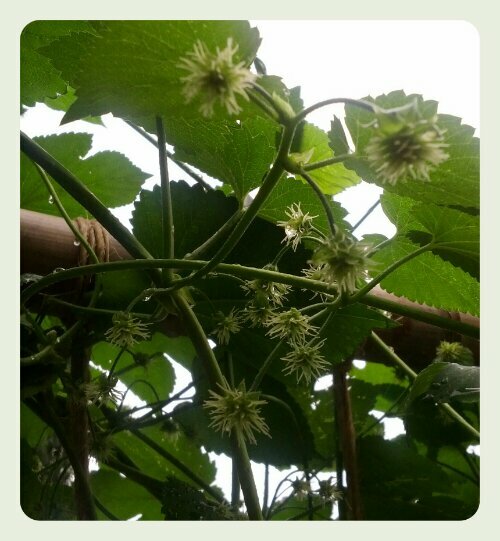 Visited my hops today and they reminded me of me: slightly immature but marvelous looking. It didn’t hurt it gently rained while I was visiting so they have a nice looking shine to them. 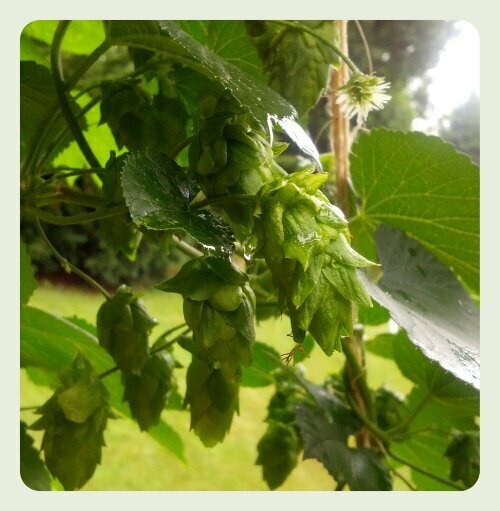 I’ve been researching on when the best time to harvest hops. Most forums say mid August – September. 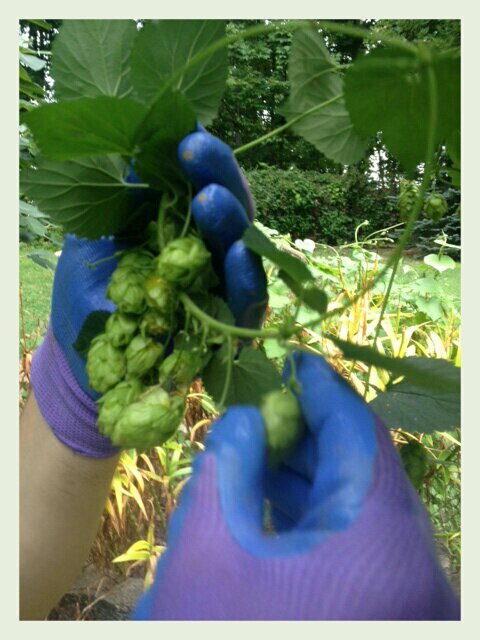 I also learned about the “squeeze test” when you squeeze the hops between your thumb and forefinger and if the hops spring back into its original shape they’re ready. These do not have the spring back I’m looking for yet but that’s okay little fellas we have time. A week ago I decided that it would be fun to visit my sister in her town of Charlottesville, VA. Visiting Charlottesville allowed me to accomplish a couple of things at once. I am able to visit with my sister who I don’t get to hang out with enough but also while I am there I am able to visit one of my favorite places in Charlottesville, Beer Run. Beer Run is unique establishment because it combines a bar + restaurant + beer store into one harmonious location for food, beer, and a neighborhood bar. 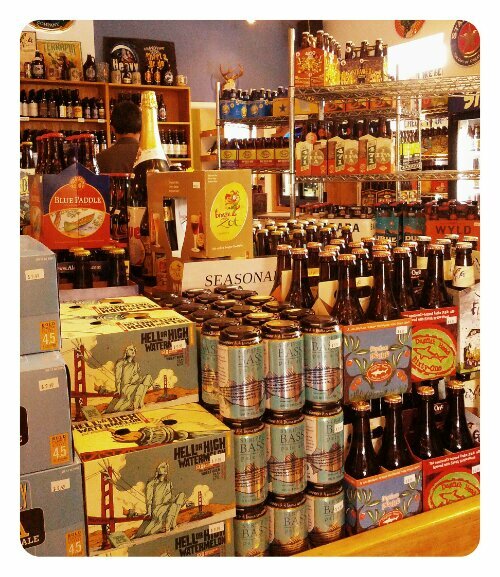 Most impressively Beer Run is able to perform these three tasks at a very high level of quality and customer service. We arrived at Beer Run while their Sunday brunch was in full swing. 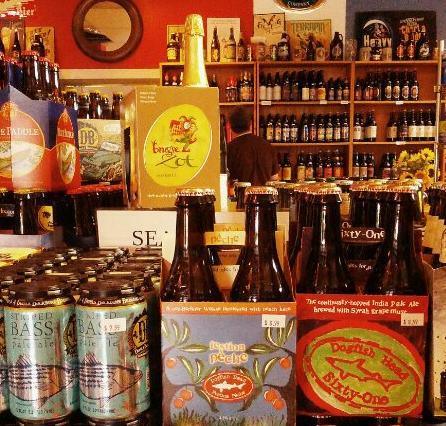 They were on a 10-15 minute wait which was music to my ears because all I wanted to do since we started our journey to C-ville was gleefully stroll Beer Run’s aisles mentally placing beers into the shopping cart in my brain. Outside of a Total Wine, Beer Run has one the a most diverse selection of beers I have had the pleasure of browsing. This is remarkable considering that the space used to display their beer inventory is around 1/100th the size of a Total Wine. 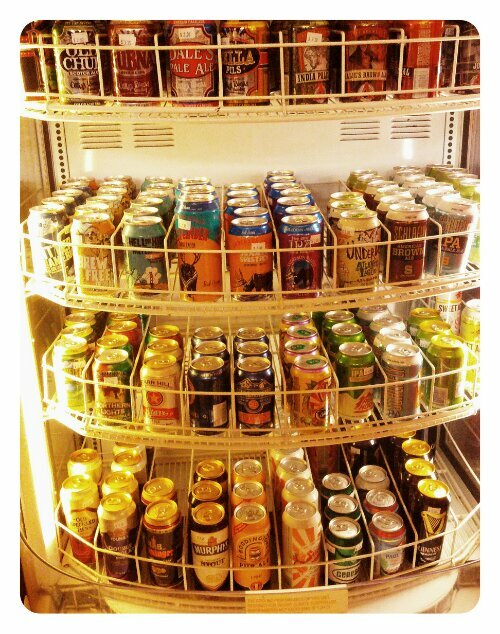 I love that they have a refrigerated shelf just for purchasing individual cans of beer. As you might remember I am a huge fan of the do-it-yourself six pack. 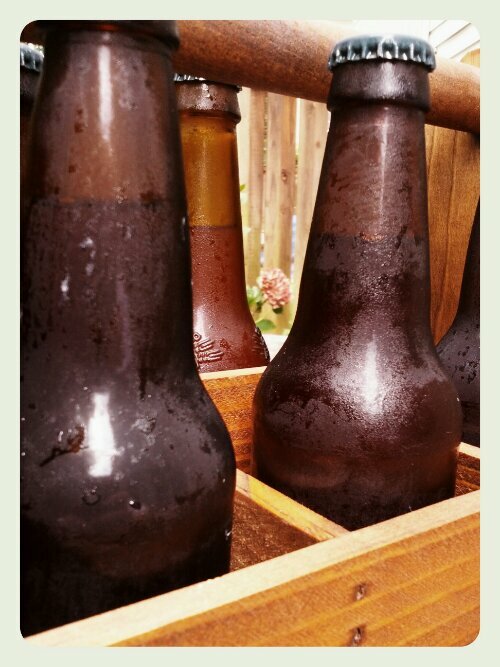 Two minor annoyances of DIY sixers are they usually only offer bottles and also you will need to cool down your beers before you can enjoy them. BOOM, refrigerated individual cans for you to create your own sixer. They of course have their own ‘Wall of Happiness’ otherwise known as shelves of 750ml bottles (not sure if anyone there refers to the 750ml bottles as their Wall of Happiness but I do like the think they get happy like me whenever they walk past it). The bottles are organized by style, location, and even personal recommendations by the staff. This is a beautiful image. 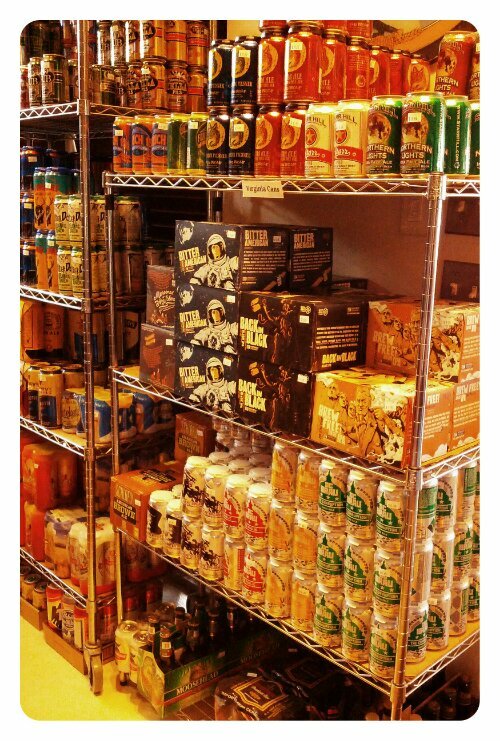 Starr Hill, Wild Wolf, 21st Amendment, and DC Brau all stacked on top of one another. I was very tempted to just try and push this shelf over to the register. Luckily just as I was beginning to loosen up they called our name and we sat down to eat. 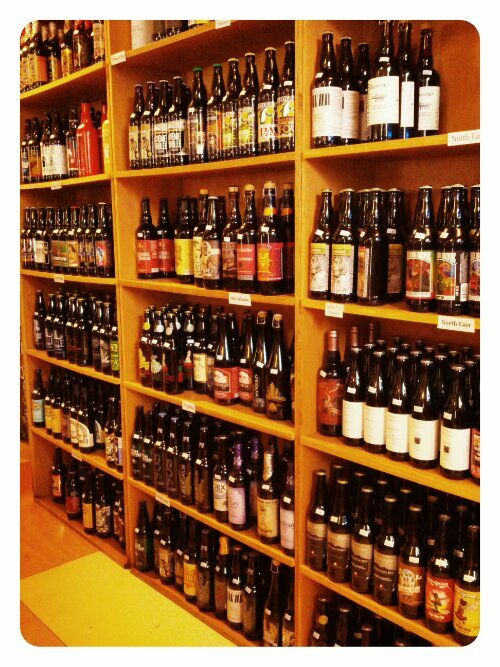 While I am always pleasantly surprised at Beer Run’s in-store beer selection what honestly shocked me the most was how delicious their food was. We were in time for the Sunday brunch and it didn’t take long for my eyes to zero in on the ‘El Guapo Breakfast Burrito’. When I’m out in public with family I try to keep my caveman instincts in check whenever someone drops a breakfast burrito the size of jar of pickles in front of me. So with as much restraint as I could muster I sliced the flour tortilla in half and gazed in anticipation as hot steam escaped from the burrito and the layers of scrambled eggs (locally grown), black beans (organic) and pepper jack cheese all oozed together. The El Guapo was served with a spicy Pico de Gallo (house-made) and Texas Frites which only increased the enjoyment of this dish. The staff was incredibly friendly and possessed a sense of urgency you only see when a restaurant has a well trained staff. They were prompt and polite with everything from inquiring if you needed a refill or asking if you had any questions about any of the beers. The only minor issue I had was that their menu contained everything they serve throughout the week. While patrons who frequent Beer Run every week might not notice for someone new or out of town it was a bit confusing. Like I said, minor, if the only issue of my visit is my own inability to remember what day of the week it is you’re doing a bang up job. Aloha B’ak’tun – Belgian Chocolate Stout from Maui Brewing Company. CoCoNut Porter – Porter from Maui Brewing Company. Eagle Claw Fist – Imperial Amber Ale from Clown Shoes. Brown Angel brown Ale – Double Brown Ale from Clown Shoes. Blonde Hunny – Belgian Blond Ale from Wild Wolf Brewing Company. Keep a look out for reviews of these great beer.